PREDDY&CO specialises in training, mentoring and consulting for design firms and in-house teams: all disciplines, all shapes and sizes, worldwide. We advise their management, guide their leadership teams and teach their people new knowledge and skills. Overall, we help them to succeed. Our tried-and-tested training workshops and programmes, leadership mentoring programmes, and strategic business consulting provides our clients with fresh thinking and practical guidelines. We might also give them the occasional challenge to their existing preconceptions. Sometimes, it takes an independent expert to see things clearly. We then add the all-important confidence and motivation to implement it all. Without that, no amount of thinking, however great it is, will result in action. The outcomes can be transformational, both for the individuals and for the whole business. If you’re running a design firm or in-house team and would like a chat about how we could help you, we’d be happy to give you as much detail as you need. Just drop us a note. And if you’re in charge of training programmes for a design association or organisation and you’d like to discuss the workshops and masterclasses we could deliver for you, get in touch. In the meantime, here’s a brief summary of our work. All of our in-company workshops are tailor-made for each firm and for each individual who joins them. This makes the training very effective, creating performance in your people and strength in the business. We coach and mentor senior teams and individuals jointly or on a one-to-one basis. It can be tough at the top, and we’re there for them whenever they need impartial advice and help in their working lives. Each person or team has different needs, so a framework will be agreed each time, with no pre-set patterns or programmes to follow. Here are some of the areas we might cover. Our vision-based strategic consulting focuses on business growth and development. For some clients we cover the whole picture, working from top-level thinking to the tiniest detail of their activities; for others, we work on specific projects. Where additional advice is needed in finance, law, technology or HR, we’ll work with your advisers or introduce you to others. Often, our clients also ask us to get involved in a range of other activities. We might work on improving company culture and structure, for example, or carry out client and prospect audits and surveys, or help them to create robust marketing strategies and plans. We also facilitate awaydays, ideation meetings and work-sessions for them. For our retainer-based clients, our Preddy Premium membership scheme for offers rapid response rates, priority scheduling and significant reductions on our tailor-made in-company training workshops. Shan Preddy’s energy-packed dynamic public workshops, masterclasses, and talks for design associations and organisations around the world are regularly sold out. Shan Preddy is the trainer, mentor and consultant on the team. After a career in PR and international advertising, she became MD of a Top-50 London branding and communication design firm before launching The Preddy Consultancy, since rebranded as Preddy&Co. Shan is a Full Member of D&AD, a Business Leader at the Marketing Society, and a Fellow of the RSA. She is also a Founder Member of the UK Design Business Association (DBA)’s accredited Register of Experts. 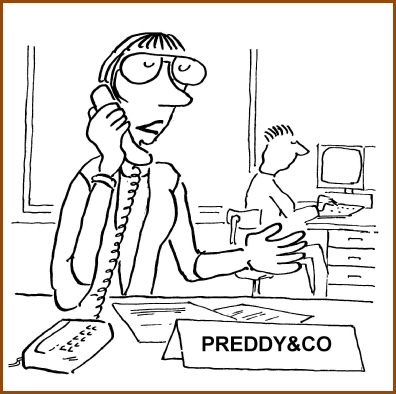 Don Preddy takes care of Preddy&Co’s own business management. An experienced qualitative and quantitative researcher with a background in academic psychology, he also gets involved in the client surveys and market analyses that we sometimes carry out as part of our consulting programmes. Shan Preddy’s books How to Market Design Consultancy Services and How to Run a Successful Design Business are published by Routledge with UK Design Council endorsement. Both are available directly from the publishers or from Amazon.